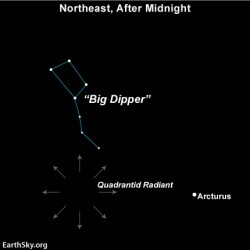 Earlier this month, on the night of January 2 and 3 the Quadrantids meteor shower was at its peak. It is an above average shower, with up to 40 meteors per hour at its peak but some meteors are still visible from January 1 to 5. The meteors are produced by dust grains left behind by an extinct comet known as 2003 EH1, which was discovered in 2003. 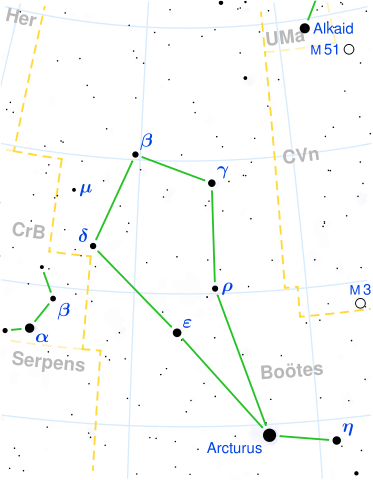 Meteors appear to radiate from the constellation Bootes. 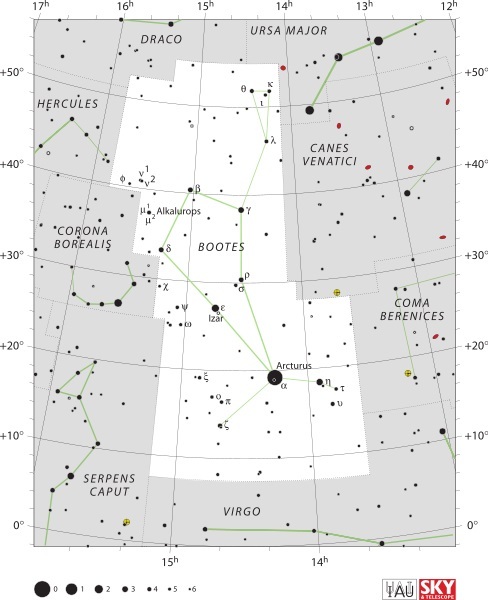 Bootes constellation map. Image credit: IAU and Sky & Telescope magazine. On January 5 the planet Jupiter was at Opposition. This means that the giant planet was at its closest approach to Earth and its face was fully illuminated by the Sun. 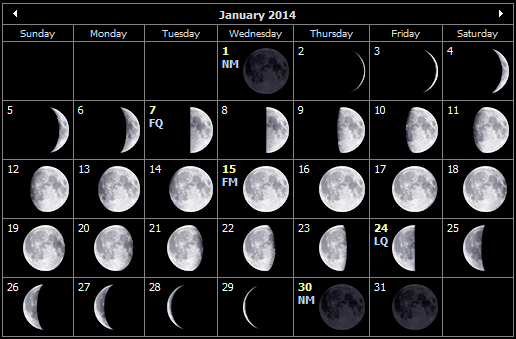 The weeks preceding and following this event are the best time to view and photograph Jupiter and its moons. With the help of a medium-sized telescope, you should be able to see some of the details in Jupiter’s cloud bands, while with a good pair of binoculars you should be able to see Jupiter’s four largest moons, appearing as bright dots on either side of the planet. Composite Cassini image of Jupiter. The dark spot is the shadow of Europa. Image credit: NASA/JPL/University of Arizona. Mercury: The closest planet to the Sun can be seen at dawn and dusk travelling across the constellation of Capricornus. This planet, being the closest to the Sun, will appear to move quickly in the night sky and its position will change in the following weeks. 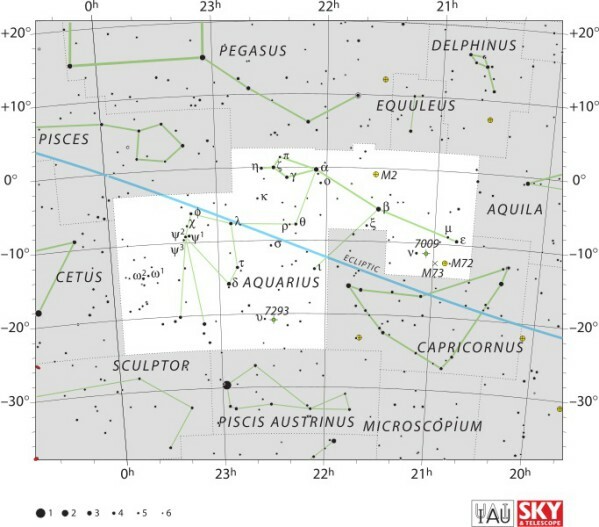 Venus: The sister planet can be seen between the constellations of Capricornus and Sagittarius. Just like Mercury, Venus can only be seen at dawn and dusk. 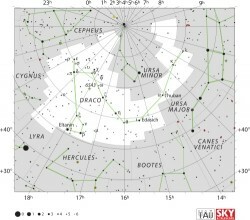 Mars: The red planet can be seen in the constellation of Virgo. 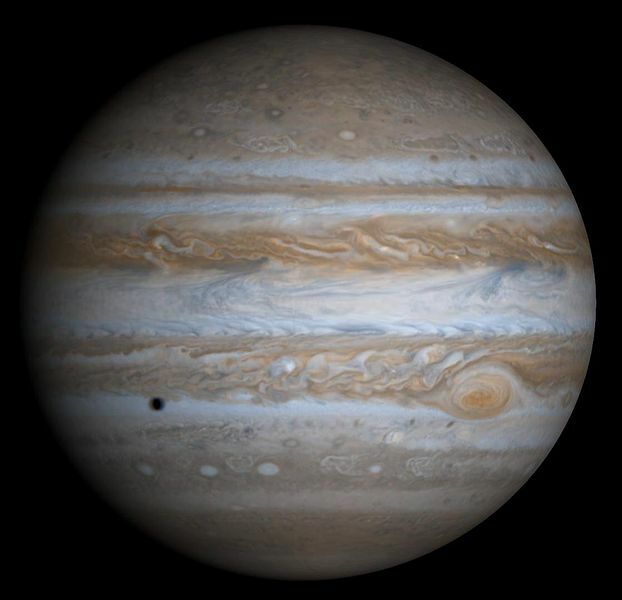 Jupiter: The gas giant is visible in the constellation of Gemini. Jupiter can easily be spotted with the naked eye, even in highly illuminated cities. Saturn: The ringed giant can be seen with the naked eye between the constellations of Virgo and Libra.